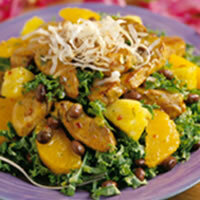 With a base of leafy green kale, the mild flavor of this pretty, nutritious salad contrasts nicely with the citrus and pineapple. Stack kale leaves and roll up tightly; slice crosswise into very thin strips; place in serving bowl. Add drained black beans. Season pork strips with 1 teaspoon coriander, salt and pepper. Heat 1 tablespoon olive oil in large non-stick skillet over high heat. Stir-fry pork strips until they are golden brown, about 3-5 minutes. Place pork strips in serving bowl with black beans and kale. In blender, combine citrus juices, remaining tablespoon olive oil, red pepper flakes, 1/4 cup pineapple cubes, remaining 1 teaspoon coriander, 1/4 cup cilantro, and salt and pepper to taste. Blend until smooth. Add tangerine sections and remaining pineapple cubes to salad bowl. Toss salad with dressing. Garnish with remaining cilantro and toasted coconut. Substitution Tip: Canned pineapple rings in natural juices, cut into cubes, may be substituted for fresh pineapple. Cooking Tip: To toast coconut, spread on shallow cookie sheet and toast in 325° F. oven for 25-30 minutes, stirring occasionally to toast evenly.